A joyous Shevuis (Shavuot) to all! 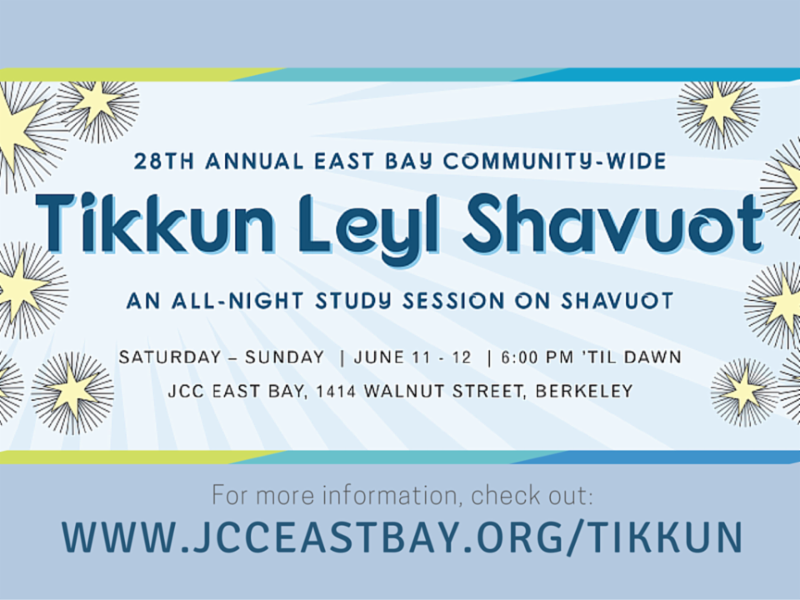 Join KlezCalifornia at the Tikn Leyl Shevuis (Tikkun Leyl Shavuot) at the JCC East Bay -- see highlighted event below. KlezCalifornia is spreading its wings to more community-wide events this Summer, both near and far! Join us at Limmud Bay Area 2016in Rohnert Park (see separate box below), and for presentations about KlezCalifornia's program Tam: Tastes of Yiddish Culture for Kids & Teens" in Illinois at the NewCAJE conference for Jewish educators, and in Montreal at KlezKanada. CABARET: Sunday, November 20, at the Osher Marin JCC in San Rafael. CABARET & YIDDISH CULTURE FESTIVAL: Sunday, December 4, at the JCC East Bay in Berkeley, featuring eight workshops. We are currently in the planning stages, so send your workshop ideas to us before the end of June at info[at]klezcalifornia.org! with Anthony Russell & Judy Kunofsky. 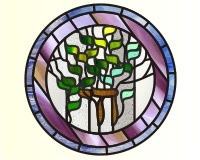 Part of Tikn Leyl Shevuis (Tikkun Leyl Shavuot), all-night study session,6:00pm - dawn, that each year attracts 600+ individuals from all parts of the Jewish community. Co-sponsored by KlezCalifornia. No charge. More info: tikkun[at]jcceastbay.org, East Bay Tikkun. 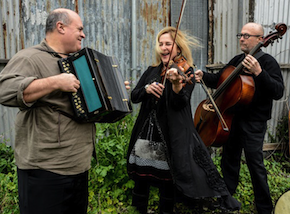 Klezmer Revival's Omission of the Music of Three Million Polish Jews, and the Salvage Ethnology of Veretski Pass. The American klezmer scene has largely passed over the music of the three million Jews who lived in pre-World War II Poland. With their new CD Poyln: A Gilgul, the Veretski Pass revives and reinterprets the mazurkas, obereks, kujawiaks and polkas that time, and most Jews, have forgotten. Cookie Segelstein, Joshua Horowitz and Stuart Brotman discuss how they discovered these songs through field and archival research, Co-presented by KlezCalifornia. No charge. More info: 415.567.3327 , jewishcommunitylibrary.org. Friday-Sunday, June 24-26, Yiddish-inspired programming at Limmud Bay Area 2016. Registration (programming, accommodations, food): $299-$549, less for children, teens, commuters. More info: limmudbayarea.org. Saturday, June 25, 8:00pm. Bruce Bierman will lead dancing. Co-presented by KlezCalifornia. Tickets: $12 advance / $15 door. 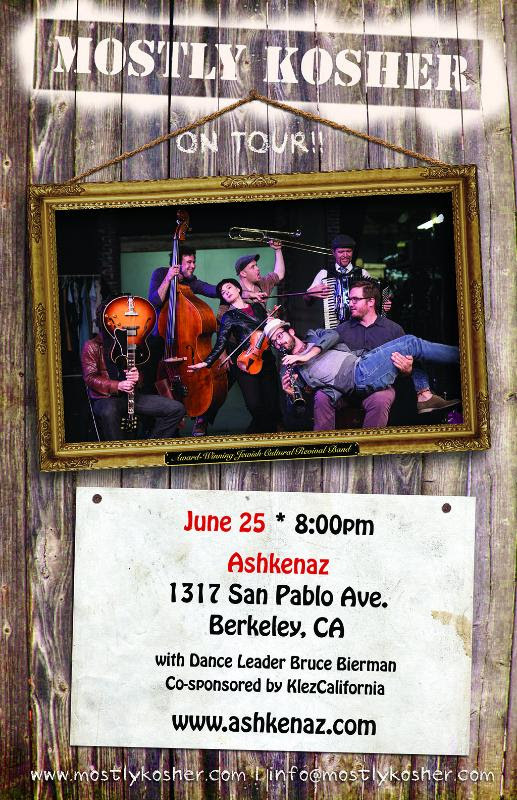 More info: 510.525.5054, ashkenaz.com. Thursday, June 23, 7:00pm. Tickets: $18. More info: 707.664.8622,Cong. Ner Shalom. Friday, June 24, 8:00pm. Tickets: $10-$15; purchase on site only. More info: 650.731.5383, Red Poppy Art House. Sunday, June 26, 4:00pm. Part of Silicon Valley Jewish Music Festival,2:00-7:00pm. Tickets: $6-$20, under 12 free. More info: 408.357.7411,APJCC Jewish Music Festival. Monday, June 27, 6:00-8:00pm. Entertainment free with minimum $10 purchase. More info:510.848.3354, Klezmer Mondays at Saul's. Yiddish not from Turkey, says analyst of paper cited in KlezCalifornia's June newsletter. See Don't Don't Buy the Junk Science That Says Yiddish Originated in Turkey by Jordan Kutzik, in The Forward. Anthology of Newly Translated Yiddish Works to read online or download as an e-book, with stories, poems, and essays. This 2016 "Pakn Treger Translation Issue" is from the magazine of the Yiddish Book Center in Amherst, Massachusetts (thanks to Talia Shaham). He calls Yiddish a language of life, so translating Oscar-winning film Son of Saul was an especially dark experience, from an interview with Mendy Cahan, head of the Israeli group Yung Yidish (thanks to Rosie Kaplan). Yiddish saying of the month: When a fool holds his tongue, he will be counted among the wise (Az a nar shvaykt, vert er oykh gerekhent tsvishn di kligeh). Polish and German also use the same proverb (from:Yiddish and Polish Proverbs, by Magdalena Sitarz). Thursday, June 2, 12:00noon, Yiddish Tish, with Reb Irwin Keller. 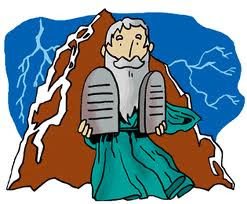 Discuss Itzik Manger and his poems about Ruth and Naomi. No Yiddish knowledge necessary. Bring your lunch. No charge. More info: irwinkeller[at]gmail.com. Thursday, June 2, 7:00pm, The Righteous Person and the Motherless Child, a concert with Cantor Risa Wallach. Mike Perlmutter on clarinet. Program includes a classic Yiddish theater piece, traditional khazones, and other music. Tickets: $10 suggested donation at the door. Rsvp requested by May 27 to rsvp[at]bshalom.org or 925.934.9446 X100. Sunday, June 5, 3:00-4:00pm, Saul Goodman's Klezmer Band, followed by Dirty Cello. No charge.More info: 510.204.0767, ohmegasalvage.com. Mir Zaynen Do (We Are Here), Jewish Folk Chorus of San Francisco's 90th annual concert. San Francisco: Tickets: $10-$15. Berkeley: Tickets: $12-$16. More info: 510.220.6325, S.F. Jewish Folk Chorus. 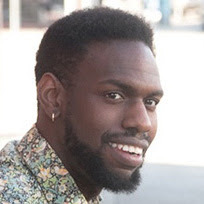 Monday, June 6, 6:00-8:00pm, Aaron Seeman (Duckmandu). Entertainment free with minimum $10 purchase. More info: 510.848.3354, Klezmer Mondays at Saul's. Saturday, June 11, time TBD, What Languages "Should" Jews Speak? See separate event box above about the Tikn Leyl Shevuis (Tikkun Leyl Shavuot). Thursday, June 9, 6:00-8:00pm, Kugelplex. Entertainment free with minimum $10 purchase. More info: 510.848.3354, Klezmer at Saul's. Sunday, June 12, 12:00noon-1:30pm, Ghost Note Ensemble; 1:30-4:00pm, Simcha Orchestra led by Eliot Kenin. Part of Berkeley World Music Festival, June 11-12, 12:00noon-9:00pm. No charge. More info: 510.995.6134, Berkeley World Music Festival. Wednesday, June 15, 7:00-9:00pm, Mama Loshn. No cover charge. More info: 510.849.1100, Le Bateau Ivre. Thursday, June 16, 7:00pm, How Could We Miss It? The Klezmer Revival's Omission of the Music of Three Million Polish Jews, with Veretski Pass. See separate event box above. Saturday, June 18, 7:30pm, Veretski Pass. Tickets: $20. Reservations required (call or email). More info: 510.525.9248, fifthstfarms[at]gmail.com, Fifth Street Farms. Monday, June 20, 6:00-8:00pm, Gypsy Moths. Entertainment free with minimum $10 purchase. More info: 510.848.3354, Klezmer Mondays at Saul's. Wednesday, June 22, 6:30-8:30pm, Klezmer Creek. Part of 4th Wednesday Klezmer Night. $5 minimum. More info: 707.544.2491, Gaia's Garden. Thursday, June 23 - Monday, June 27, Mostly Kosher. See details of all five performances in separate event box above. More info: Mostly Kosher. Thursday, June 23, 7:30pm, YidLife! A Scandalous Comedy. With the creators and stars of Yiddish comedy web series, YidLife Crisis, Jamie Elman and Eli Batalion. Tickets: $15-$30. More info: Palo Alto JCC. Friday-Sunday, June 24-26, Yiddish-inspired programming at Limmud Bay Area 2016. See separate event box above. Tuesday, June 28, 8:00pm, YidLive! A Web Series Masterclass with the Creators of YidLife Crisis, Eli Batalion and Jamie Elman. Tickets: $12-$15. More info: Jewish Film Institute presents YidLife Crisis. Wednesday, July 20, 6:30-8:30pm, Klezmer Creek. Part of 4th Wednesday Klezmer Night. $5 minimum. More info: 707.544.2491, Gaia's Garden. Sunday, July 24, 2:00-4:00pm, KlezCalifornia Flisik Yidish Salon. For fluent Yiddish speakers. More info: 415.789.7679, flisik[at]klezcalifornia.org. Friday, July 22, thru Saturday, August 20, The Gathering, a play by Arje Shaw. Includes Yiddish. Tickets: $29-$35, more for opening night. More info: The Gathering in Berkeley.